Declan O'Reilly was on his way to retiring from a life undercover when his final case took a potentially fatal turn. Blowing his cover to protect the only reason he stayed on the case to begin with becomes a challenge when money and power corrupt the very agency he was sworn to trust. Going off the grid, where nobody can find them, he learns his desire to protect Lydia is more than just a job. He risks it all to protect the one thing he thought he could never have. She fights to discover what she's really made of only to find its what he saw in her all along. Not once, but twice, fate offers a maniacal twist that can tear them apart, as much as it can drive them together while trying to outrun the extensive reach of a diabolical criminal. Sometimes you have to break rules to protect what you love. 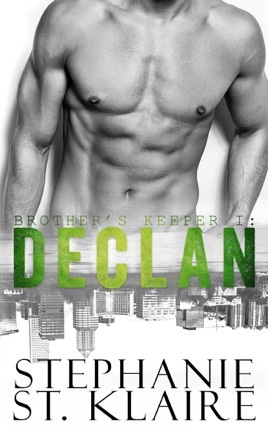 Can Declan's own Brother's Keeper Security help them find their way, or does it just put more lives on the line while the unlikely couple fights for forever? Wow! What a ride! SSK does a fabulous job of keeping you guessing right to the end. A fantastic romantic suspense with a ton of action. Declan & Lydia's story literally goes across the country as they try to figure out how to defeat the enemies that seem to want nothing more than to keep this couple apart. Action from start to finish. I loved every twist and turn. Our favorites from McKenzie Ridge are there too. This Book Will Blow You Away! I’m honestly not even sure where to begin with this story. Declan and Lydia seriously BLEW ME AWAY in this book!! Stephanie St. Klaire has a way with writing that puts many authors to shame. This book was so well written, the characters were perfectly developed, Declan was HOT, and Lydia was just a perfect match for him. I really can not recommend this book enough. It’s full of suspense, steamy scenes, and two characters trying to survive together and fight their feelings. This was a perfect start to the series. I promise you will love it! You can’t read this and not fall in love with Declan and those O’Reilly boys. I absolutely loved this book. From the first page, I was completely captivated by the angst, suspense, and nail biting anticipation. Not to mention the completely swoon worthy Declan to top it all off. Declan and Lydia’s story will give you all the feels.